This entry was posted in Exchange 2010, Mobile and tagged EAS, Exchange2010, Mobile by Michel de Rooij. Bookmark the permalink. Hi, I’m having a similar problem but with 2007. Which entries should I make sure are . Nice, but bit will be set again after next AdminSDHolder cycle so it’s recommended to use a non-Admin account instead of fixing it this way. Hello, I was having a problem with my iphone accessing my new exchange 2013 server, it would not sync. I discovered that if did the below I got it working on my iphone. That location is used to register ActiveSync devices; removing it may temporarily work (until AdminSDHolder kicks in). what is the best way to apply it for all users ? 1) I am a domain admin, don’t have inheritable permissions checked, and therefore can’t sync my e-mail to my phone. You stated that “In fact, every hour the DACL on members of protected groups will be reset and inheritable permissions will be removed.” If that is the case, then what good does it do to check the inheritable permissions box? Won’t it just be cleared the next hour? 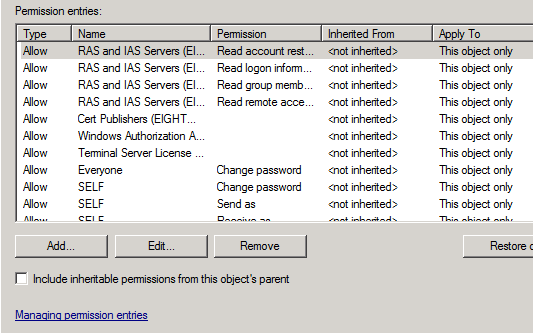 2) Is there a security risk in checking the inheritable permissions box for members of the Domain Admin group? If Windows is built to not have permissions inherited for Domain Admins, maybe it is best to leave that unchanged. 3) Do users who are not members of a protected group need to have their permission inheritance box checked to sync on ActiveSync? At one point I had granted everyone local admin rights for a day so that it would make adding the drivers to the printers created on a replacement server easier to accomplish. Apparently, this has turned off the permissions inheritance for everyone. I am now moving to Exchange 2013 and recognize the ActiveSync issue for domain admins (and for all users until I fix it). It appears that as long as you keep the existing Activesync device (Exchange doesn’t have to create anything new) that things should work OK, even for the domain admins’ email accounts, right? Only if they change devices will Exchange have problems creating the device due to the permissions inheritance being turned off. I recovered my exchange server from a disaster, and things haven’t been exactly correct since. I need to know the default permissions for each exchange object so that I may manually enter them before granting inheritable permissions. The exchange objects had no permissions granted, and I had to enable all for all exchange objects at the domain level for things to begin to operate. I feel this is sloppy. HI, I am facing an issue in recovery password for all the users who are accessing active sync. I am having Exchange 2013. Kindly guide me for getting the recovery password for the devices whoa re using active sync. There’s no such thing as a recovery password, or I didn’t understand your question. what about server 2012 R2? What about what? It’s OS-independent, AdminSDHolder is an AD feature. See the Michael B. Smith article referenced. 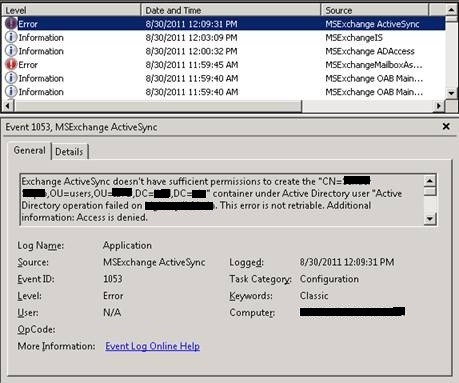 I have never been able to get Exchange 2010 & Active Sync working with my phone on my admin account no matter what I do. And believe me, I’ve tried everything over and over and over several times over the years. I’m starting to think it’s cursed. According to most of the posts out there all you need to do is clear a check box and it works. It doesn’t. Not even for a moment let alone a 60 minute cycle.